I spent last Saturday in the throes of a fever dream. Flashing colored lights hit me straight between the eyes as foreign faces danced furiously around me. There was endless food and drink, and the entire celebration, which raged from early evening to early morning, felt as though it had been imported from another world. But I wasn’t sick, nor was I dreaming. 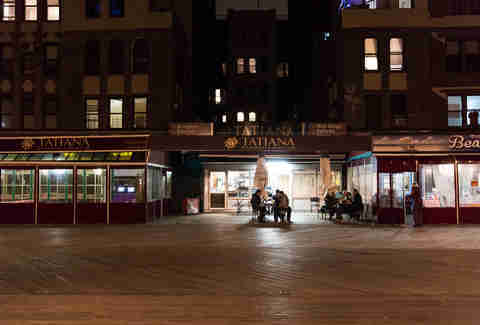 I was at Tatiana Restaurant in Brighton Beach. In the 1930s and ‘40s, supper club-style restaurants were popular evening destinations across America, designed to host and entertain patrons from cocktail hour through post-dinner dancing in a clubby yet sophisticated atmosphere. They later popped up in Brooklyn’s Russian-speaking neighborhoods, particularly along Brighton Beach, in the ‘70s and ‘80s, around the same time as a neighborhood rejuvenation due to a relaxation of the Soviet Union’s immigration policies. 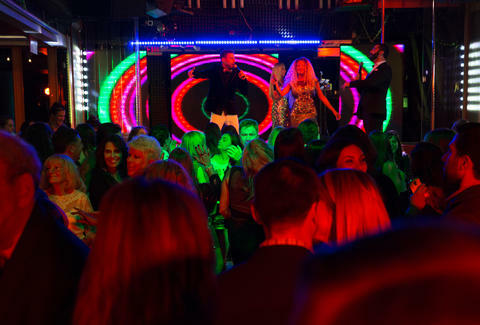 The area quickly became crowded with Russian nightclubs and restaurants, offering late nights of dancing fueled by vodka and blini with black caviar. These venues celebrated a couple decades of great success before steadily declining due to decreased Russian immigration to the US and the further integration of young generations of Russian speakers into contemporary American culture. Although supper clubs have never had a true American resurgence, some of the venues have remained open and in operation as if decades past never quite ended. 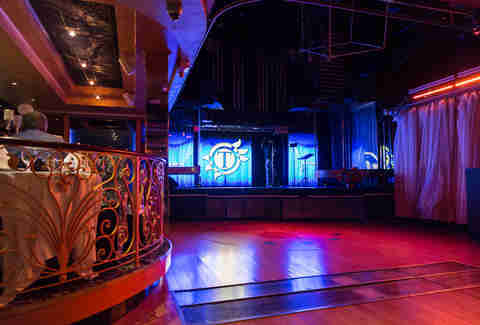 Tatiana, one of the last remaining clubs in the area, is a kitschy, extravagant, dreamlike dinner-and-more-than-a-show experience. After stepping off the frozen boardwalk, we entered Tatiana and were greeted with pounding, bass-heavy music and lights cast low and blue. Long tables were set in the main dining room, piled high with plates upon plates of food and bottles of Russian vodka and crowded with large groups of gussied-up patrons. It felt vaguely like entering a wedding reception we weren’t invited to. We managed to flag down the host and were quickly ushered to a table practically on top of the wooden dance floor and accompanying stage. Tatiana is known for its weekend extravaganzas, pairing copious amounts of food with over-the-top entertainment and dancing. Saturday is the night to go, as it’s typically the most festive of the week. My friend and I made a laughably small party in comparison to the other collections of revelers, likely because the banquet menu that is offered serves enough for at least four people. We had the option to order off the a la carte menu, but after looking around at all the dishes we couldn’t even identify, we opted for adventure. We pulled our bottles of wine from our bags and set them on the table before us. It was go time. It felt like we’d crashed a wedding, a bar mitzvah, a sweet sixteen, and a bridal shower. Dining here is a high-energy production. There were several large metal serving tiers set up on our small table, and before we could even uncork our wine we had waiters descending upon us with at least six plates of food. Almost every dish was served with absolutely no explanation and left entirely up to interpretation. A heaping bowl of hybrid chicken-and-egg salad was topped with fried onions, and long strips of smoked salmon and butterfish were covered in lemon juice and capers. We were also served, strangely, a full Greek salad. “I’ve never been under so much pressure to eat in my life,” my friend said. At one point, our waiter stood in an obvious state of great anxiety as we played plate Tetris with half a dozen half-eaten appetizers. We were piling cold meats onto mayonnaise-smothered salads, strips of cheese onto pureed eggplant. It was like being in a Russian grandmother’s kitchen if you hadn’t seen her in months, you were looking thin, and the kitchen also happened to be a nightclub. In the midst of appetizer mayhem, four people materialized on the stage before us. From our vantage point, we could see everything and were probably among the first to glimpse this glitzy group. A man who looked absurdly like Adam Levine (it was definitely Adam Levine) greeted us and began speaking in rapid Russian. After noticing several puzzled faces in the crowded space, he swiftly transitioned to English, explaining that they had a wonderful performance planned for us, and we should eat, dance, drink, and enjoy. Simple enough, we thought, as the colored lights began swirling overhead. Adam Levine was accompanied by three equally attractive and engaging performers: another man in a three piece suit and two women in floor-length, prom-like sequined gowns. The four of them immediately launched into a rendition of “How Deep is Your Love” by the Bee Gees. I anticipated overwhelming displays of apathy typical of us New Yorkers, but to my surprise, everyone around us was engaged and attentive, even as waiters continued to parade out of the kitchen. One of the women sang Etta James’ “At Last” so powerfully, I briefly wondered if the performers were lip-synching. After several improvised riffs with pipes that rivaled those of Beyoncé, I quickly abandoned the idea. Several solos later, the quartet ganged up for a “Let’s Get Loud” cover, and diners began flocking to the dance floor. The energy was ramping up and I could hear my heart in my ears as I joined the garlic-scented masses. It was ridiculous and terribly fun, and then, without warning, the evening’s party shifted into its next phase. We were asked once again to take our seats and a table was rolled to the center of the dance floor. 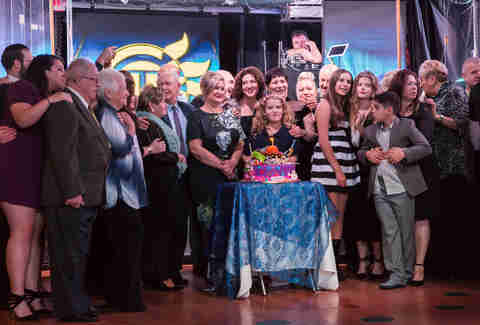 A giant, elaborate birthday cake was then ushered out as a family of 20+ crowded the dance floor to pose for pictures and offer well wishes. Adam Levine MC’d the ordeal, inviting group after group to the stage. With each new group came a new cake, every one more elaborate than the last, with cause for celebration ranging from birthday to bachelorette party. It’s customary, clearly to this day, to celebrate achievements and milestones as a Russian community at these supper clubs. Ari Kagan, a prominent member of the neighborhood, told me, “We go there for birthdays and anniversaries, weddings and high school reunions, press conferences, and heritage celebrations, concerts, and Town Halls, interesting contests and emotional memorials -- you name it.” How fascinating that all of these events (town halls and memorials, no less) were hosted in a place known for its liveliness and excitement. At one point it started snowing on the stage because, really, why not? By the time the cake and the singing was over, it felt like we’d crashed a wedding, a bar mitzvah, a sweet sixteen, and a bridal shower. We didn’t know any of these people. And it didn’t matter. What happened next is something I very well could have hallucinated (perhaps it was the wine?). We were eating and drinking as a thin, sheer curtain was pulled across the dance floor. Graphics that looked like they came from a Windows 98 screensaver started dancing across the fabric as the colored lights continued to dim and the curtain whooshed open and spotlights flooded the stage. Out of nowhere came four beautifully-costumed Russian “dolls,” bouncing across the stage to folkish Russian music. They soon partnered with four men, all in equally elaborate getups. There was hand-holding and skipping in circles in addition to more advanced choreography. The dancers disappeared as soon as they arrived and the stage dimmed once again. Next, a hollow metal cube lowered from the ceiling, and two dancers in skin-tight leotards came out alongside the Beyoncé clone from earlier. She launched into a beautiful, melodic song as the cube began to spin and the dancers wound themselves around its metal beams. The whole room forgot about the food and drinks in front of them, fixated instead on these trance-inducing acrobatics. 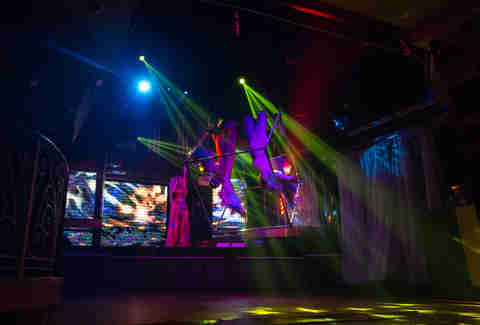 The remainder of the acts were all equally high-energy and bizarre, from what can only be described as a Thai-infused Jewish wedding scene to an all-out Western, with male dancers slashing bedazzled whips at one another. At one point, they put a girl in a box and start impaling it with wooden stakes. The whole thing was equal parts magic show, cabaret, and complete hallucination. People in seats farther back gathered in the aisles to get a better view of the can-can segment, the belly dancers, the pyrotechnics. You can try to make sense of the progression of acts, but there doesn’t seem to be reason in any of it. At one point it started snowing on the stage because, really, why not? And then, like the flip of a switch, it was over. Everyone in the room sat with mouths agape, scrambling to applaud as the waiters continued clearing plates and bringing out new ones, as if we hadn’t already consumed two full meals worth of food. Some patrons took to the dance floor while others continued eating, and I took this lull in the night’s events to look around. We weren’t as out of place as I had expected us to be, and while I heard snippets of Russian conversation jumping around, there didn’t seem to be a shortage of English either. “Many native-born Americans and tourists from other states come to these restaurants,” Kagan confirmed. When I moved to New York I came hungry for something new, something I couldn’t find anywhere else. This is a mentality shared by most who come here, and Tatiana, with what Kagan describes as “superb food, beautiful music, a great show, and an opportunity to become familiar with Russian culture and cuisine,” certainly fulfills that desire. In a brief conversation over by the bachelorette table, packed with girls in mini-dresses and necklaces strung with plastic male genitalia, I asked if the bride-to-be was Russian. One of the girls looked up at me, confused. “We’re at a Russian restaurant,” I offered. “Oh, we found it online,” she said, giving me a brief moment of consideration before turning back to her vodka. I did managed to speak with several Eastern European patrons, though, from Russia to Ukraine. 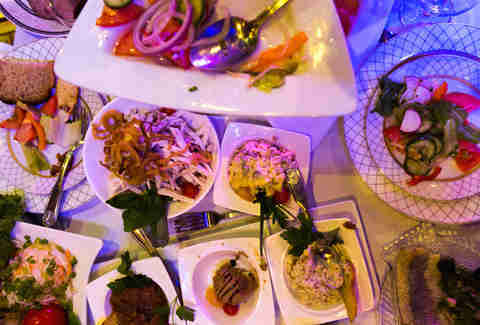 For them, a primary pull towards Tatiana is the element of nostalgia, in both the cuisine and the entertainment. It’s a connection to home separate from the current conflicts, a time to dance and celebrate and come together. Being there as an American felt like an invitation to another world, just a subway ride from my backyard. Our dessert arrived and the music had picked up, with the original four entertainers belting out a range of current hits to a crowded dance floor. It was around 1am at this point, and Tatiana’s transition into a club had officially begun (a waiter told me the festivities could go until as late as 3am). We watched the crowd while picking at a massive fruit tray and finishing our final glasses of wine. A photographer who had taken pictures of us dancing earlier approached us, offering an 11”x14” glossy photograph of my face, smiling in the sea of the dance floor. He walked away just long enough to convince me it was a gift before returning and asking for $15. Tatiana may feel like one giant fever dream, but for just $15 extra the proof is all yours. Deciding it was time to go, we stumbled back out into the night with muffled music in our wake, our heads buzzing with visuals of swirling lights (and wine) as we nursed overly full stomachs. I turned back to stare at a relatively quiet facade, save for the occasional flicker of neon light through the window. At one time, and not too long ago either, there was Odessa, Winter Garden, Imperator, Rasputin, Metropol, Primorsky, and a myriad of other similar restaurants settled in this neighborhood, never sleeping, beckoning patrons into another endless and lively night. This makes Tatiana seem all the more special, all the more necessary to preserve. I’d gone to one of the best parties in New York, and it wasn’t in a Bushwick loft or a Lower East Side speakeasy. It was in a place that’s historically significant to its surrounding community and alluring to those outside the neighborhood, as well, with the goal of uniting strangers from all walks of life in the name of a common language, familiar food, and something to celebrate. Sarah Anderson is the Senior Production Assistant at Thrillist and likes her smoked fish with a side of pyrotechnics. Go exploring with her on Instagram @smileforsarah and Twitter @sarah_jfa.